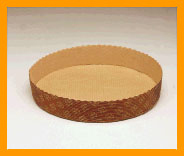 BAND/BOTTOM: pure cellulose calendered paper-micro-flute corrugated. Substance 125-145 gsm. 2 colours printed band.